The book you see here just came in the mail. 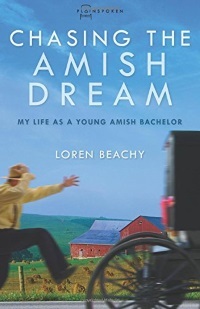 It’s called Chasing the Amish Dream: My Life as a Young Amish Bachelor, and its author is Loren Beachy. Loren Beachy is an Old Order Amish auctioneer and elementary schoolteacher. Born in central Ohio, Beachy became a Hoosier at eight years of age when his family moved to northern Indiana. After attending Reppert Auction School at age eighteen, he attained his dream of being an auctioneer. Beachy, a columnist for the Goshen News, resides with his parents and eight siblings in Goshen, Indiana, where he teaches school and conducts auctions. He is a happy member of the Old Order Amish church and enjoys fast horses, strong coffee, and hot peppers. With chapter titles like “The Pen Is Mightier than the Breakfast Burrito”, “Wisecrack Wanda”, and “How the Catfish Cleans His Teeth”, the book looks fun. As we often do when new titles come around, we’ll be doing a giveaway and Q-and-A. And you get to come up with the questions for Loren. Leave a question on this post, and I will pass them along to Loren on Monday so he can choose some to answer. Asking a question here also gets you an entry into the Chasing the Amish Dream book giveaway. I am practically a neighbor of yours (I’ve probably passed your buggy near Goshen a time or two! ), and having grown up in Amish country, I am pretty comfortable around Amish people, though there are none I have known at a personal level. I know the Amish are just people, like anyone, doing their best to live as they think right. I have been a bit uncomfortable when I’ve had out-of-town visitors who wanted to “see the Amish” as if your community were a tourist attraction. (I know, in a sense, it is.) Sometimes, I wonder what it must be like to be so “visible” to the community around you, and to know that there are tourists who actually travel from miles around to see Amish people. Once I saw an Amishman at a McDonald’s that was providing very poor service that night. As anyone might, he looked frustrated with the long wait for his order, yet I could see in his face that he was “struggling” to control his irritation. I found myself wondering if it was because he was simply trying to turn the other cheek (not always easily done), or if part of the struggle was knowing that everyone in the restaurant could see that he was Amish, and if he were to speak sharply to the clerk, they might think ill of all Amish. I know, of course, you can’t read the mind of that one particular man, but can you tell me if you believe many Amish feel a “burden” of responsibility at being so identifiable to the public? I don’t want to win a copy of the book, but I would like to ask a question anyway. We’ve read through different Amish America posts that the farm life is not as lucrative as it once was for many Amish (and non-Amish alike) and that many Amish people seek out careers outside of the home / farm, for instance the biographical information provided for your book states that you are both a school teacher and an auctioneer in addition to author and columnist. Acknowledging that, have you ever found resistance among your community toward your career paths as perceived to be immodest, very much unconventional or against community rules, or perhaps just against the personal opinions of other people? How do you (and any of your Old Order Amish friends you want to speak for) feel about the interest/curiosity/fascination of the rest of us into your way of life? This sounds like a very unique book to be written by an Old Order Amish gentleman…can’t wait to partake in the humor! I am interested in knowing what percentage of the teachers are male, as Loren is, compared to the customary young females that are teachers. Thanks! As a school teacher, are you concerned with the federal government interfering with what and how you teach? We have Amish friends in New York and one of their boys wants to be an Auctioneer when he grows up. Is their any books that we could get for him to read about Auctioneering? I would love to read your book. Seeing you are a bachelor I was wondering if there was a certain age that Amish men and women are expected to be married by? Are there many Amish who remain single all their life? If you were too marry, could you retain your job as a teacher or would you have to get another occupation? I was wondering how far you travel for auctions, and is this your first book? Thanks for sharing parts of you and your communities life. I work in an elementary school also. I am curious about how you think Amish scholars and “Englisch” students are the same and how they are different. I was just talking with some 8th graders about how non-fiction doesn’t hae to be boring…this could be a great start for them! Is Loren the oldest in his family? How old is he now? Is it just coincidence that your name is also Leroy? Have you ever been compared to Leroy Van Dyke? I am assuming you are more than twenty two or twenty three, which in our old order Mennonite society is the “right” age for men to marry. Do your mother, aunts or sisters ever ask you when you are going to “grow up, settle down and get married”? Or do they just assume that no girl would want a “character like Leroy”? I am sorry if my questions are too personal; perhaps you have a girlfriend and are secretly planning marriage this winter. As a teacher, does your book also get into some of the more serious aspects of plain life, or is this basically a recreational read? How do you manage to do justice to all of these occupations and interests? My father, 4 of my sisters and three of my daughters have taught old order school and they seemed to find school teaching alone to be enough of a challenge although most of them have at one time or another done some writing as well. Tomorrow (Sat), Readers can ask Loren in person at Gospel Bookstore in Berlin, OH! This is a delightful, lighthearted glimpse of Amish life, with laugh out loud moments sprinkled in. I especially enjoyed it, because it was written by someone who is Amish. I wish you well with this new book, Loren. My question for you Loren is when you are teaching history at school for your scholars are they learning your Anabaptist history or basic history you would find in public school or a little of both. I didn’t know if Anabaptist history was taught mostly at home. This looks likes a very interesting read. Thank you for the question and answer and opportunity to win a copy. I guess my reading comprehension or memory work is not the best – sorry I got your name wrong. Just one more thought Loren have you ever thought of writing for the Connection magazine? Will your book be available in a Family Christian Book Store? There is one in Battle Creek, MI where I do my shopping. Sounds like a book I would enjoy. Would you share with us how you decided to become a teacher? Who encouraged you to take this path? What sorts of books do you like to read for your own personal edification? Thank you for sharing your thoughts with us! How many auctions a year do you do? Who pays for your efforts? and are you limited to a certain geographical area or can English drive you to more distant events? I’m thrilled to have a chance at this book. Thanks! Having been a resident of this state for nearly 65 years and having never been away from home for more than 10 days at a time and only two times, at that, I have a sense of place here in Northern New Hampshire. Also having visited communities in Pennsylvania, new York and Michigan where the Amish thrive, I have yet to ask an Amishman this question; Why do you think there are Amish all around my state but no communities here? No Amish in Vermont, although a few families gave it a try in the mid-70s. Since a settlement is starting between Whitehall and Granville NY, they are getting awfully close to Vermont. Being an immigrant myself as my name suggests, I’ve always wondered where the term “Pennsylvania Dutch” comes from when Dutch are the last thing these people are? Just like on the Amish show on TV, they claim to speak “Dutch”. What? If that were the case, I wouldn’t be able to understand what’s being said, but I do for the most part. After several hundred years of being in America, what’s spoken by the Amish now is a bastardized form of German, a farmer’s German if you will, but certainly not Dutch, which is spoken in Holland. Even a bible which was displayed by one of the Amish on that show was written in German, not Dutch. I believe the term came from English speaking Americans. When a German immigrant was asked by them what he was, he’d answer, Ich bin Deutsch, or I am Deutsch, the German word for German. Americans not knowing the difference between Deutsch and Dutch and having difficulty pronouncing the “sch”, opted to settle for the word Dutch because it was easier for them to pronounce. In other words, it was close enough for them, not realizing that the 2 represent 2 different countries. The Old Dutchman mine is another such case. He too was German, not Dutch. I read your posting to my son, Mark, who joined the Amish. He said that you are absolutely correct in how Pennsylvania Dutch came to be called Dutch. The Amish speak a dialect of German. Mark says that when he was in Germany, an elderly gentleman told him that the way Mark was speaking was so much like the dialect spoken by his grandfather who was an old farmer in the Rhineland Pfaltz region of Germany. He said that Mark’s accent and many of the German idioms Mark uses are Pfalzich Deutsch. I hope that’s how you spell Pfaltz. Is it hard to teach in a one room school house? How do you keep up with the different grades and students? I had two questions but they have been asked. I would still like to win a copy of your book so please enter me in the drawing. During the short time I was in the Elkhart/LaGrange area, I had the chance to observe students (both English and Amish) at some public schools in the area. I am assuming you teach at a private Amish school. What do you think makes parents choose one sort of school or the other for their children, and do they generally stick with that choice for all their children? Here, I am specifically wondering about children with special needs who might be the fourth or fifth child–if the previous children had all gone to Amish school, might the parents consider sending the child with special needs to public school, or does that usually not happen? I’d like to know what the prank is involving pink duct tape and black pepper? I happen to be a prankster myself! Hi I’d like to learn about being amish, I was wondering if you could tell me some cool things you like about. I have 23 animals total goats, chickens, cats dogs,…….. And I find the Amish fascinating. Thanks. How many young ladies want to court you right now, and how do you know that they are interested in doing so? As a teacher how do you keep up with all the different ages & grade levels in a one room school house. I think it would be very difficult to teach from grade one through grade eight? I truly hadn’t heard of an auction school before. I thought it was more of a “craft” handed down from father to son (or are there any female auctioneers? Would a female be allowed to attend auction school? Just curious, as I know several women whose voices are loud and carry quite a ways! 😉 ! Loren, your book sounds like a hoot! I’d sure love to read it, whether I win a copy or not! I read the publishers info earlier this week in an email from a library journal publication I subscribe to…how hard was it to be permitted to publish your book, being Old Order Amish? I wish you success in all aspects of your life! I love Amish Produce Auctions.. Do you ever call at any of them? I’d love to know also if you have a listing of Produce Auctions in Ohio… Or anywhere else for that matter. I know is one in West Salem Oh and there was one in Homerville too. Do you know if the Homerville Auction closed? I’ve heard all sorts of rumors, both that they’re both operating and then that only one is. I’d love to know if you or anyone else knows. Would love to read your book. Please enter my name in the pool. 1. Forgive me, but I was not aware Amishmen were school teachers. Is this normal for Amish? Or unique to your situation or group of people? 2. If you’re a bachelor, how old are you? Just curious, if you’re still young and plan to marry or are (most likely) a lifetime bachelor? 3. Is becoming an auctioneer and attending the classes for it usual among the Amish or is it frowned on in some communities as being higher education? Thanks so much for writing this book. I almost don’t like to say it, as I’m not a “gawker,” but I’m very intrigued and fascinated by the Amish lifestyle and love learning about the culture and the individuals as well. This book sounds very entertaining & educational as well! I would love to ask Leroy: What is the one part of Amish life that you feel is most beneficial to building strong character in your children (or those you teach)? What do you think is the overriding advantage/benefit of the Amish lifestyle? I applaud anyone that has a good sense of humor. Life has plenty of solemn moments to it but most things are not as serious as people make them out to be. Humor lifts us up, changes our moods from dire to delightful. Question: Do you take much heat from others in your community for being a celebrity of sorts? Everyone has asked such good questions! Will look forward to the answers! As I don’t want to repeat, I am entering my name, thank you. I’d love a copy of the book, so will have to come up with a question. . . .Hmmmmm. If you could visit any foreign country for a week (on someone else’s dime) where would you go, and why? What do you think your biggest hurdles were in attaining your dream? Is life different for you as an Old Order bachelor than it would be otherwise? I”ve known only a handful of single people over the age of thirty and so am wondering how life is different for you? Thank you, Loren, for sharing an insight into your culture. Who is your favorite author? What has been your inspiration for writing? How do you relate personally to Jesus? Congratulations on your recent book “Chasing the Amish Dream, My Life as a Young Amish Bachelor”. It caught my attention as a prime example of the type of book we value highly for our collection at the Pacific Northwest Mennonite Historical Society where I volunteer. Our 2600+ volume library collection of books and pamphlets authored by Mennonites and about Mennonite issues and history is dependent on the generous donations of the members and friends of Pacific Northwest Mennonite Historical Society and authors of the books we value. What happens if an Amish Woman who is married is having Fertility Issues and isn’t having any children . What does she do ? She and her husband would either accept it as God’s will and/or potentially consider adopting. Amish do adopt both from within the community, but more often, from outside the community.